Kicking off a new course for higher education faculty members will be a webinar focusing on why higher education is important and how to reach students through free open courses. The live webinar introduces the new online course, “Connected Courses,” which is being taught by open-learning pioneers, who developed the curriculum for fellow college and university professors to learn to teach their own open courses. The webinar features Randall Bass, vice provost for education and English professor at Georgetown University; Cathy N. Davidson, distinguished professor and director of The Futures Initiative at City University of New York; and Michael Wesch, associate professor of cultural anthropology at Kansas State University. 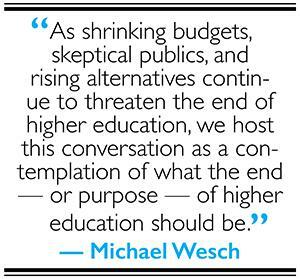 Bass, Davidson and Wesch will discuss the purpose of open higher education. Connected Courses, supported by the University of California Humanities Research Institute, Digital Media and Learning Research Hub and MacArthur Foundation, runs from Sept. 15 through Dec. 14, with a pre-course orientation beginning Sept. 2. Connected Courses is a free online course. For lessons, instructor bios and more details, visit connectedcourses.net.